Many homeowners aspire toward a pristine and lush lawn. For some a nice lawn gives them feelings of pride. Others believe a perfect lawn enables them to have the best-looking house in the neighborhood. Many homeowners spend hours outdoors perfecting their lawns or spend a good deal of money hiring professionals to make their lawn more appealing. But just because a lawn looks good now doesn't mean it will look good later. That's because delicate grass can be damaged by a number of different factors. Grubs are not very lawn-friendly. Grubs are actually the larval stage of different types of large beetles. These worm-like creatures feed on the roots of grass and are able to kill large sections of the lawn in a relatively short amount of time. It can sometimes be difficult to discern whether grubs, drought or another other pest has damaged a lawn. One way to check is to grab a portion of the damaged lawn and attempt to peel it back. If it comes back easily like a piece of carpet, it's likely grubs. Spotting grubs underneath is a sure sign these larvae are killing the lawn. Using an insecticide for grub control in July can help kill off grubs that start hatching in August through September. Grub eggs do well in sunny patches of lawn that are well watered. More shade may deter them. There's also the option of letting the lawn go dormant and not watering it, but you will be left with a brown, unappealing lawn. 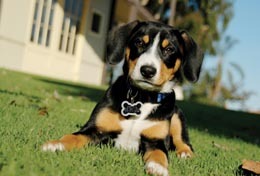 Pets can also damage a lawn. Pet urine can create burnt patches and significant discoloration on the lawn, particularly if the dog or cat uses one area consistently as their potty zone. The best way to prevent urine damage is to walk your dog so that he or she will not have free reign of the yard. However, sometimes dogs get out or stray cats and dogs visit your yard and relieve themselves without your knowledge. So this method is not foolproof. Therefore, you should take added action to maintain a lush lawn. First, make sure that soil and lawn is in good health by fertilizing and taking care of it properly. Second, water can dilute urine and neutralize its corrosive properties. Some have found that diluted urine can often act as a fertilizer to grass. You may have noticed that the outside ring of a urine-burned spot is often greener than the healthy lawn. Try to dilute the urine prior to 8 hours having elapsed for the best effect. Moles and voles are among the more common lawn damage culprits. Voles are small rodents that resemble mice but have stouter bodies, shorter tails and rounder heads. They feast on everything from bulbs, succulent roots, ground cover, and even dead animals in their paths. Their burrows enable them to move around relatively undetected, typically until the damage has already been done. Moles, although they have a similar-sounding name, are not related to voles and look very different. They have a cylindrical body shape with velvety fur, very small or invisible ears and large paws for digging. Moles often feed on earthworms and other small invertebrates found in the soil. The burrows they create are essentially traps for the worms, who fall into the burrows, where moles easily access them. Moles often stockpile worms for later consumption in underground larders. Voles can be kept away with natural vole predators, such as cats, hawks, owls and snakes. Mouse traps can also capture voles when baited. You may also dig sharp materials or chicken wire into your soil around planting beds to make it uncomfortable for voles and moles to tunnel through. Moles can also be controlled with traps. Finding active mole tunnels will help you place the traps effectively to either kill or simply contain the mole. The live animal can be relocated to a site where they won't cause trouble. Lawn damage can occur through a number of different factors. Finding out the cause can help you find an effective treatment.